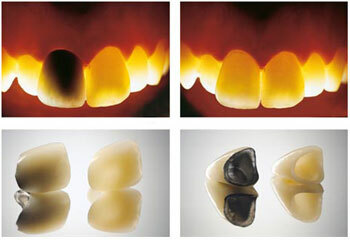 All-ceramic crowns are fabricated entirely out of a glass-like compound such as porcelain. Some types are handmade by a dental technician but some are milled out of a block of ceramic by CAD-CAM machine (Zirconia)(Click here to know more about CAD-CAM Technology) . Both techniques offer their own advantages. All-ceramics are commonly placed in those situations where the aesthetics are of utmost concern in front teeth. All-ceramic or all-porcelain dental crowns provide better natural color match than any other crown type and may be more suitable for people with metal allergies. The single biggest advantage of all-ceramics, as compared to PFM, is their more lifelike appearance. Additionally, the elimination of the metal core allows for light transmission through the porcelain for better optical, life-like properties and a higher level of esthetic. As described in PFM, dark line of metal is never a concern in all-ceramic crown, either initially or if gum recession occurs later on. In comparison, all-ceramic crowns, even those made from the most modern materials, can generally be considered to have relatively inferior physical characteristics like strength, hardness, brittleness and resistance to fracture. Though certain disadvantage, all-ceramic crowns are a good choice for front teeth. To know more details about various crown and bridge of various types according to process of manufacture and material, click below link….